If you have a single or dual DI stage we highly recommend a triple TDS meter as it will allow you to see your TDS readings in three places. We will usually suggest installing the triple TDS meter post source water, post membrane and post DI stage. These three readings will notify you when it's time to change the RO membrane and DI resin. 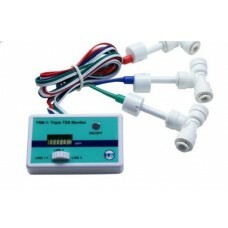 The TRM-1 Triple Inline TDS Meter from HM Digital is one of the most essential reverse osmosis accessories. This tool uses electrode probes to monitor the TDS of your reverse osmosis system in three places and lets you know exactly how the system is performing. Installing the triple TDS meter post source water, post membrane and post DI stage. These three readings will notify you when it's time to change the RO membrane and DI resin. This unit features a digital display and comes with three 1/4" Quick Connect Tee's. As with all HM-Digital products, the TRM-1 comes factory calibrated. Factory Calibrated: calibrated with a 342 ppm NaCl solution.